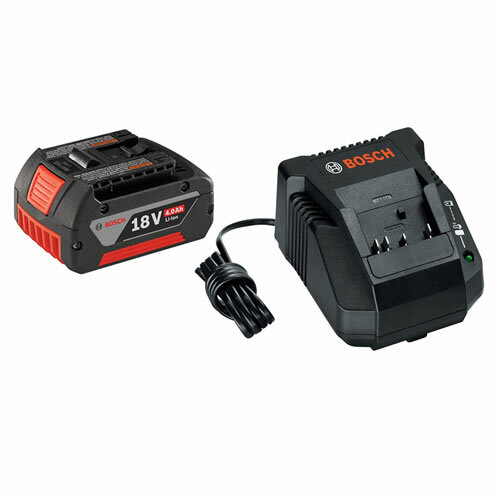 Design and build your very own Bosch 18 V combo kit or expand you current system with a state-of-the art Bosch 18 V Lithium-Ion battery and charger. The SKC181-101 is the perfect way to kick off your Bosch cordless power tool system. The Bosch 3.0 Ah battery features Electronic Cell Protection which guards against overheating, overmold, and deep discharge. Cool pack technology pulls heat away from the battery to increase overall battery life by 100% when compared to previous generations. The SCK181-101 is compatible with any Bosch 18 Volt Lithium-Ion tool, making it extremely convenient across tools. It features a visible battery fuel gauge, so you no longer have to guess when you need to charge the battery. This battery features Bosch's high performance cells that are extremely robust and supply high currents with a minimum energy loss.